Does your baby love or loathe bath time? Do you find yourself constantly encouraging them to enjoy the water? Thankfully, my little one is a fan and always thinks it’s an action-packed adventure. But I know of others who dread the sound of the tub running. A bubble bath is a great way to turn tub time into play time. It’s also a different sensory experience for them — which is all part of their development. But best of all, I find it’s a great time to bond. Whatever your reason for adding bubbles, it won’t take you long to realize there’s plenty of choices out there. Finding a suitable soap could turn into a long, drawn-out process, and what mom has time for that? To speed up your search, l would like to share some pointers with you. 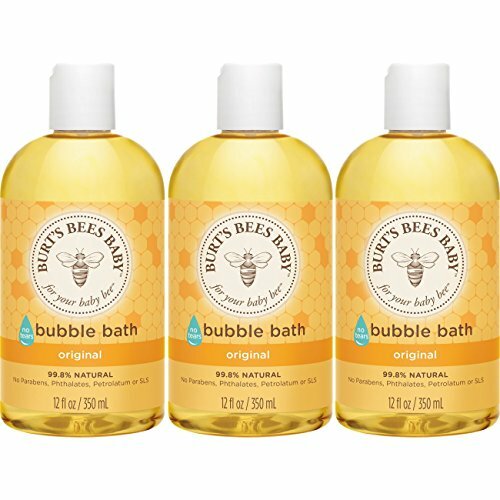 These could help you figure out the best baby bubble bath for your little one’s needs. I’ll even show you how quick and easy it is to make your very own bubbles. Use the links above to check the latest prices or read our in-depth baby bubble bath reviews below. Is Bubble Bath Safe for Babies? How Do I Give My Baby a Bubble Bath? Before your baby takes the plunge, you might be wondering when they can start using bubble bath. Is it safe for newborns? Questions have been raised surrounding bubble baths and an increased risk of UTIs in young babies. This is one reason why some medical experts suggest little ones under three years old avoid soapy suds (source). Even if your child is over this age, they could still be prone to infection. The difference is that older children can let you know when something is wrong. However, you may be able to lower the chances of UTIs at bath time. Try not to let the little one soak in the tub for too long, and encourage your baby to pee after bathing. While your baby doesn’t talk and can’t communicate their symptoms, it’s up to you to keep an eye out for them. These can include strong smelling urine or frequent urination, obvious discomfort, or a mild fever (source). If you’re tempted to add your favorite soak solution into your baby’s bath session, think again! What might feel relaxing and soothing for you, could irritate your baby. Babies have ultra-sensitive skin. This is because it’s just one-fifth as thick as an adult’s skin. It takes time to build up the body’s barricade we have as grownups, and a baby’s first year of life is their most vulnerable (source). Anything you put onto your child’s skin should be baby-specific. Bubble bath for babies is made with milder detergents for a gentle cleanse, and shouldn’t dry out the skin. When choosing a baby bubble bath, there are a few things to consider. Some might be down to personal choice, others are essential. Check the small print: If a bubble bath claims to be child-friendly, don’t assume it’s ok for all ages. Some products may not be suitable for use on young babies or toddlers. Ingredients: If you find a list of ingredients you can’t even pronounce, would you want to use that on your child? Natural ingredients tend to be less harsh for a baby, and you should have an idea what they are. Even if a bubble bath claims to be natural, always check the small print! There might be some man-made ingredients hidden inside. Research any components you don’t know of. Tear-free formula: It’s only natural for a baby to splash around in the tub. If you want to avoid dramas, opt for a bubble bath mild enough not to sting their eyes. Scent: You might want to consider a fragrance that you find appealing, if opting for a scented product. Think about baby too: even at an early age, children could have clear preferences or aversions to certain smells! Also, consider that scents could be irritants for baby’s skin. Now that you have more idea of how to give your baby a bubble bath, you’re ready for the next step — choosing the bubbles! 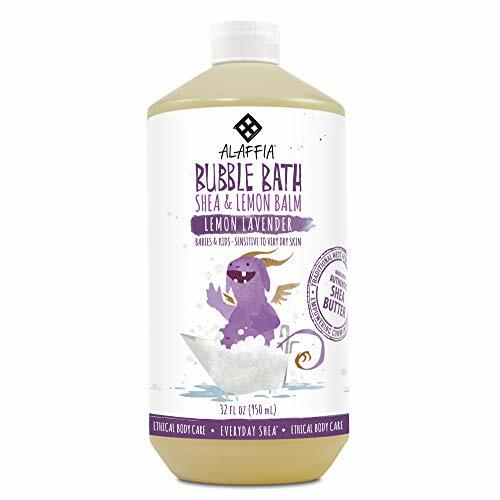 Moms who care about the planet, as well as their baby’s delicate skin, will find Alaffia baby bubble bath hits the spot. I love the fact this product takes an ethical approach; it’s fair trade and totally natural. You can forget about dyes, gluten, animal products, or harsh sulfates irritating your baby during bath time. The core ingredient is raw shea butter, which helps moisturize and soften baby’s skin. As for fragrance, the lavender and lemon balm is a hit with moms. Plus, it’s great for bedtime bathing; the relaxing qualities could help you put baby down sooner. Other options include mint and eucalyptus — handy for clearing stuffy airways. But how does this bubble bath hold up? Well, you get lots of bubbles using very little of the product. However, this “oomph” can make the final wash down a challenge. Would be easier with a pump top. Can be tricky to rinse off. Does your baby break out in a rash around perfumed soaps? Are you tired of dealing with irritated skin from other products? 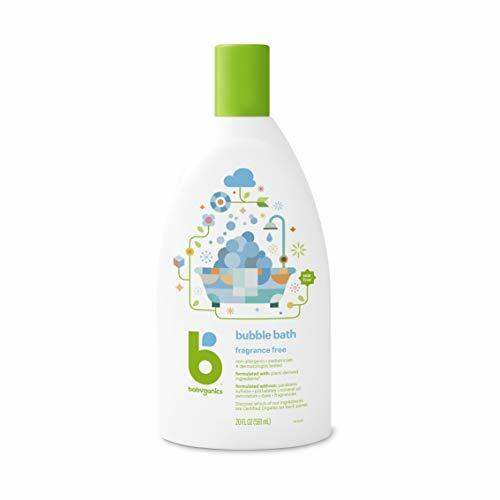 Babyganics fragrance-free bubble bath is totally free of the harsh stuff, such as artificial dyes and parabens. Plus, it’s non-allergenic and has been tested by experts. It uses a mix of natural fruit and vegetable extracts, to both cleanse and nurture your baby’s skin. This includes sunflower, tomato, black cumin, red raspberry, and cranberry oils. What I really like about Babyganics is how gentle it is! Even little ones who suffer from eczema can enjoy bubble baths with this. Suitable for babies with skin conditions. You need to use a lot to get the bath super bubbly. As a mom, your days are full-on. If you’re like me, and don’t want your bathroom to resemble a beauty salon, Babo Botanicals could be a solution. This 3-in-1 formula means your little one can play in the bubbles while you get down to business! 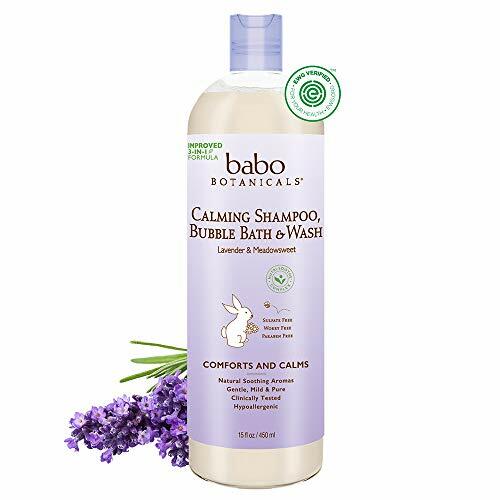 Shampoo baby’s hair, wash away the dirt, and nourish skin all at the same time. It’s also allergen-free and made of natural ingredients: great for moms who want to avoid chemicals. Despite being scented, the formula is tear-free. One issue to note, this bubble bath is lavender scented, which some people don’t like. I love it and so does my family — including daddy. Shampoo, body wash, and bubble bath, all in one product. The lavender scent could double as a sleep aid. The lavender scent may not suit everyone. Consistency is a little watery. 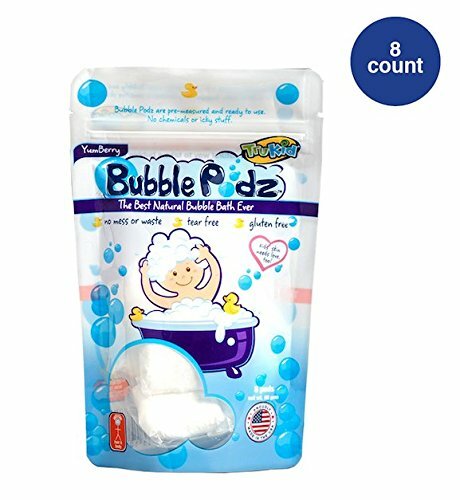 These bubble pods could save you the typical pre-bath struggle and post-bubble bath clear-up — no sticky bottles or spills! All you have to do is take out a pod and drop it in the bath. Does your little one like to get hands on? Encourage them to hold onto the pod and watch as it transforms into bubbles. If your children love a big bath full of bubbles, you might find the podz lacking. The bubbles produced by one pod can be a little underwhelming in a big tub. You may need to use more, which makes it more costly. Pod system eliminates mess and waste. Leaves no residue on baby or bath. One pod is insufficient in larger tubs. Very little scent to the product. If you have children that differ in age, you could save time, and money, by buying just one bubble bath product. Burt’s Bees is geared for children of all ages — even the tiniest of tots! This hypoallergenic bubble bath is appropriate for use on the most delicate of skin. This makes it ideal for babies and children who are extra-sensitive. This bubble bath is 99.8% natural, with a mild fragrance. Ingredients include sunflower and coconut oil, which can help to restore moisture back into the skin. Suitable for babies of all ages. Fewer bubbles than some other products. Safety first: Just as with a regular bath, safety comes first. Make sure the room is warm, and all potential hazards (like razors) are safely out of reach. Bath mat check-up: Soapy bubbles increase the risk of slips and slides. Your bath mat should be non-slip with a firm suction grip. If it’s seen better days, replace it — it might not live up to the job. Bath temperature: Baby-soft skin is delicate, which means it’s super vulnerable to scalding. Running the cold tap first should make sure the water temperature doesn’t get too hot. Keep it around 100 degrees Fahrenheit and test it first with a bath thermometer, or your elbow (source). Water level: Don’t fill the bathtub with too much water. It’s fine for bubbles to be up to baby’s chin, but water shouldn’t be. Two to four inches is more than enough. Keep it short: Staying in the bath too long might dry out your baby’s skin. Aim to keep bath time to no more than ten minutes. Rinse thoroughly: You should wash away any soap residue with clean water. To reduce the risk of UTIs, pay particular attention to baby’s private area. If you’re feeling creative, you might want to try a DIY project. Why not try your hand at making your own baby bubble bath? Castile soap: this bubble maker is made from vegetable oils — usually olive oil. You can pick and choose the type you buy (e.g., organic). This type of soap is entirely free of animal fats, which means it’s vegan and eco-friendly (source). Vegetable glycerin: This a non-toxic liquid, made from plant oils. It’s a natural moisturizer and, most importantly, child-friendly (source). Essential oil: You can mix in a drop or two of essential oil (like lavender) for scent. If your baby is particularly sensitive, it’s best to skip this ingredient. Mix two cups of castile soap with half a cup of vegetable glycerin. Pour a quarter of the bubble bath mixture into the bath under running water, and enjoy! My top pick has to be Alaffia Baby Bubble Bath. As a mom, I don’t want to be exposing my child to synthetic soaps at bath time. I also want the future of the globe to flourish for my little one’s sake — Alaffia addresses both these issues. It’s also suitable for everyday use and kind to sensitive skin. The gentle formula could go a long way to preventing tears in the tub. Let’s not forget the whole point of a bubble bath — lots of long-lasting bubbles! Alaffia ticks that box too. Do you have any DIY baby bubble bath recipes to offer? Do you have any top bubble bath tips? Share in the comments; we would love to know your secrets! What are the Best Baby Bath Thermometers?